Senior Dog Health - When Is It Time to See the Vet? Regular veterinary examinations are important for overall health at any age. Annual examinations are the norm, but more frequent exams may be needed, based on your pet's health. As a dog ages, signs of potentially serious health problems are commonly overlooked by pet owners as "normal for an old dog." Some changes are to be expected with old age, some are not. Learn to watch for, and differentiate between, normal and possible medical problems for your senior dog. It is much better to err on the side of caution and have anything new or unusual in your dog checked out as soon as possible by your veterinarian. Older dogs don't usually have the reserve that younger dogs do, and time is critical. The following list denotes signs that should be seen by your veterinarian as soon as possible. As always, if your pet is in pain, lethargic or simply not "normal," please consult your vet. This is especially important for senior pets - they may hide illness better and they do not often have the health reserves they did as a younger animal. Arthritis pain - As previously mentioned, there are many medications available today to help ease the pain and discomfort of arthritis. See your veterinarian to discuss what medication is right for your pet. Bad breath, bleeding gums - Good dental health is important not only for the teeth and mouth, but overall general health. As a dog ages, tartar, gum disease, and tooth loss are all potential problems. Oral cancers, infections, metabolic diseases (kidney disease, Diabetes Mellitus) are also potential causes for bad breath and oral health problems. Sudden blindness, hearing loss, head tilt / staggering - These signs can be seen with a variety of causes - infection, poisoning, age-related, cancer, etc. and your vet should be consulted to find the cause and begin any necessary treatment. Note: some dogs can develop cataracts in just a few days, with sudden onset diabetes. See your vet as soon as possible. Change in weight or appetite - Weight loss or weight gains should be kept track of, as well as any changes in diet or eating habits. Dogs should be fed a diet appropriate for their age and general health (some dogs require special or prescription diets). Change in urine output and thirst - Dogs should not drink more water simply because they are old, it is summer time, or the heater is on in the winter. The most common causes of increased water intake are diabetes and kidney problems. Urine leakage or having "accidents" also signal problems, either with infection, loss of sphincter control, or ​another underlying disease. Cognitive Dysfunction - Dogs, like people, can experience age-related dementia. There is a treatment available that may help some dogs. Common signs (and treatment available) are outlined in ​this article. Hair loss, itchy skin - This can occur at any age, and should not be ignored. Dogs can do a lot of damage to their skin by licking, scratching, and chewing, so the sooner the dog is examined, the better. This list isn't all-inclusive - If your dog is "not himself or herself," then it is time for a check up at the veterinary clinic. 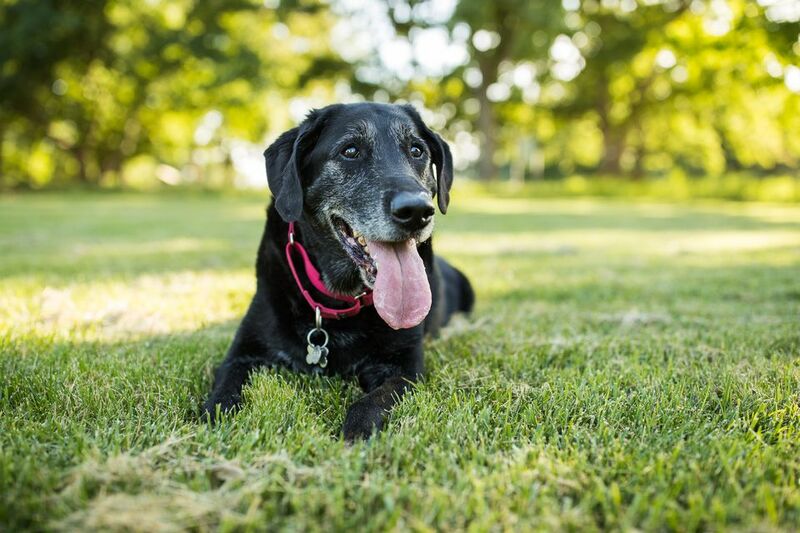 Don't expect too much from your senior dog - s/he may want to run and play Frisbee like the good 'ol times, but go slow -- heat, arthritis, age-related muscle atrophy, and other age-related effects can take their toll. Ease distractions - senior pets can be easily startled by or become fearful of: kids, loud noises, and general commotion as they age. Conditions such as arthritis can make the dog fearful of getting hurt (or the potential to get hurt) with sudden movements of kids or being stepped on. Are there any websites, support groups, or other places that I can learn and share about my senior pet? The Senior Dog Project - One of the original sites promoting senior dog adoption and care. Owners of blind dogs - Information and support for owners of blind and visually impaired dogs. Deaf Dog Education Action Fund - Information and support for owners of deaf dogs. My senior dog is drinking lots of water. Is it just old age? Why (and what) is my senior dog "leaking"? What Are Common Health Problems in Senior Dogs?